October 29th, Hurricane Sandy made landfall. 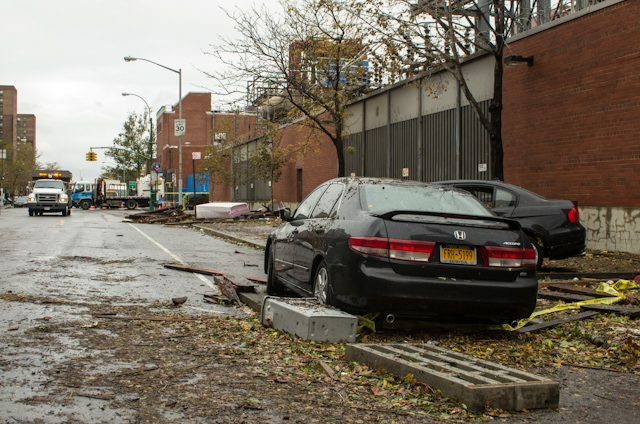 The eye of the storm passed over New Jersey but the hurricane winds, and worse, a massive storm surge hit New York City. The storm surge, combined with high tides and sea level rise created a superstorm that sent waters rushing into the coastal areas of New York. As images of the floods began to circulate, I got a sense of eerie familiarity. 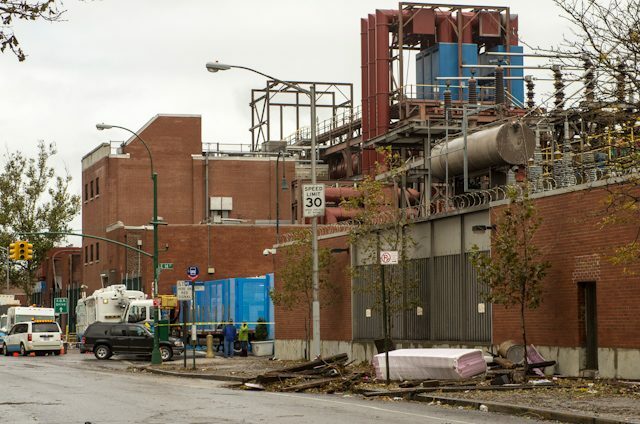 The debris line near the 14th street power station (where an explosion knocked out power for lower Manhattan for almost a week), the flooded Battery Tunnel entrance in Manhattan and the water soaked communities of Red Hook and Dumbo. These images and places were where I had walked, in 2007, slowly drawing a blue chalk line along the ten foot above sea level line. I knew the areas well, met community members and witnessed everything along that line. I was creating a visualization based on a report written by climate scientists in 2001, which forecast more frequent severe flooding (from stronger storms) with a worst case scenario of a devastating flood once every four years by 2100. The intention of the HighWaterLine project was to create a spectacle around which people could gather to engage in a conversation about climate change and their role in changing future scenarios. The project has now become a rally cry for what we knew then and what the challenges we face now. What is the place and power of art at the intersection of science, the environment and policy? 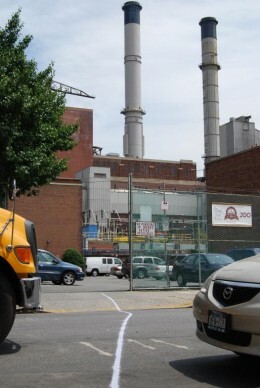 And what power does art have on participating in the ever changing urban landscape? Public works have the power to disrupt our daily routine and in so doing, leave an indelible impression upon us, scientific study even upholds the notion of the power of the unexpected From this place, art becomes an entry point for a memorable experience that can inform personal and community decisions. Some works create a space for a deeper experience and contemplation – Agnes Denes’ “Field of Wheat,” at once informed and motivated consideration on the culture of development and displacement. The “I Wish this Was…” project by artist Candy Chang sought to spur greater action – creating a space for creative thinking about development by and for a community. Artists have a distinct ability to approach a problem or visualize an issue in a way that might exist outside the rubric of peer-reviewed reports, bureaucratic infrastructure and other frameworks which seek to create impediments instead of inspiration. Artists use visualization and emotion to convey information that could elsewhere read as dry and uninspired. What are the various roles inhabited by art or artists that might allow participation in global issues? Art/ist as commentator. Not merely editorializing on contemporary issues, but translating the facts into a work that creates an emotional experience. A successful project can go beyond the act of re-stating an issue by inciting questions and action. Art/ist as collaborator. Working with science & scientists to create works that make complex knowledge accessible, and can be taken into the wider community. Mary Miss’ City as Living Laboratory/1,000 Stepsproject engages local communities, artists, scientists, planners and other stakeholders come together to design and develop projects to address sustainability along the Broadway corridor in NYC. Art/ist as witness. Work can create a space for community reaction, or act as a method of observing and documenting those reactions. Art/ist as storyteller. Stories as a tool for communication are jarringly powerful. The personal relationship to issues and information creates an emotional connection. Acting as witness is also a method of collecting and redistributing stories. Art/ist as catalyst. Creating works that spark or inspire change in thought and attitude or act as instigator for discussion play an important role in transfer of knowledge and civic engagement. Art/ist as innovator. Unhindered by existing frameworks, artists can restructure and reinvent solutions and methods of engagement through artistic acts. Art/ist as community builder. An artist can provide an object or event upon which people can focus, showing their support, enthusiasm or varied passion. Xavier Cortada‘s Reclamation Project, which engages communities in the act of nurturing and planting mangrove trees in Florida is a simple act in which participants gain knowledge and a sense of acting to reverse the devastating impacts of development on their own communities. After Hurricane Sandy, my work was used by Elizabeth Kolbert, writing in The New Yorker, as setting the stage for comprehension of the great challenges that lay ahead for the city of New York in addressing future floods. It was also used by Bill Weir, on ABC Nightline News to create a local visual tie to global climate change impacts as documented by the Extreme Ice Survey time lapse documentation of glacial retreat. For me, this is indicative of the great role that art can play of focusing attention and translating complex situations into powerful, visual statements. This entry was posted in Environmental Art and tagged 000 steps, 1, abc nightline news, advisory board, agnes denes, art and the environment, bill weir, blue chalk line, candy chang, city as living laboratory, dan lurie, dumbo, elizabeth kolbert, environmental art, environmental art blog, environmental art project, environmental education, eve mosher, extreme ice survey, field of wheat, gothamist, highwaterline, hurricane sandy, i wish this was, mary miss, new jersey, new york, new york city, public art works, public works, reclamation project, red hook, SCEE, schuylkill center, schuylkill center for environmental education, the new yorker, the schuylkill center, xavier cortada. Bookmark the permalink.